Dry to moderate moisture. Woods, prairies, thickets, roadsides. Full to partial sun. This is a 12″ to 48″ tall, erect, perennial forb that rises on a single stem from a knotty rhizome. The rhizome has conspicuous, large scars that mark the position of the stems of previous years. 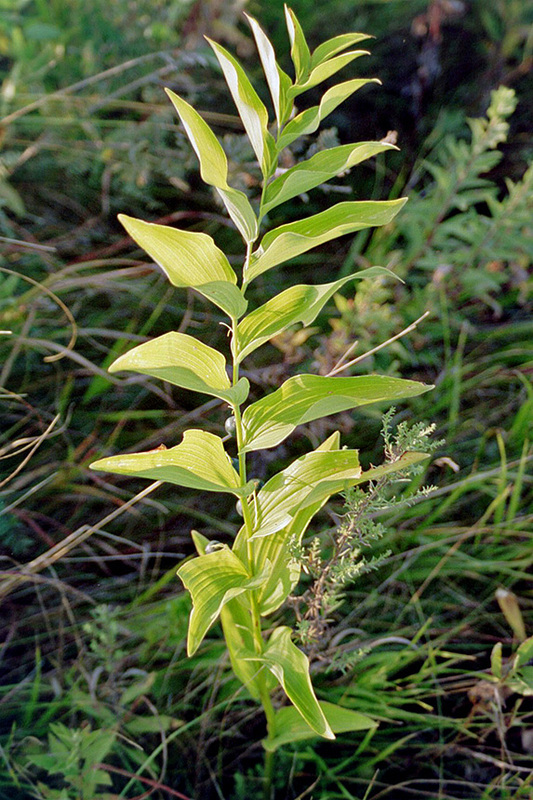 The stems are erect, arching, unbranched, leafy, and hairless. They are not jointed at the leaf axils. The leaves are alternate, stalkless, often clasping, narrowly lance-shaped to broadly elliptic, 3½″ to 8″ long, and 1⅛″ to 3½″ wide. They have 7 to 19 conspicuous, parallel veins. The upper surface is green and hairless with recessed veins. The lower surface is paler green, hairless, somewhat covered with a whitish, waxy coating (glaucous), with prominent (raised) veins. The inflorescence is a small cluster of 2 to 15, though usually 10 or fewer, flowers hanging downward from most leaf axils. The cluster stalk (peduncle) is green, flattened, and arched like a bow, but not strongly bent backward. It is ½″ to 1½″ long when in flower, elongating to 2½″ to 3½″ when in fruit. The individual flower stalks are shorter than the peduncle. The flowers are ½″ to ⅔″ long. There are 3 greenish-white or yellowish-green petals and 3 similar sepals (6 tepals) united at the base into a cylinder-shaped tube ending in 6 short, erect, flared, or spreading lobes. There are 6 stamens and 1 style that do not protrude from the tube. The fruit is a globular berry, 5 ⁄16″ to ½″ long, with several seeds. It is initially green, becoming dark blue-violet when it ripens. Common false Solomon’s seal (Maianthemum racemosum var. racemosum) is a shorter plant, reaching no more than 30″ at maturity. The stem sometimes zigzags. The leaves usually have only 3, sometimes 4 or 5, parallel veins. The inflorescence is plume-like, with white star-shaped flowers on a branched panicle at the end of the main stem. The fruits are green with reddish-purple spots when young and pink to red when mature. 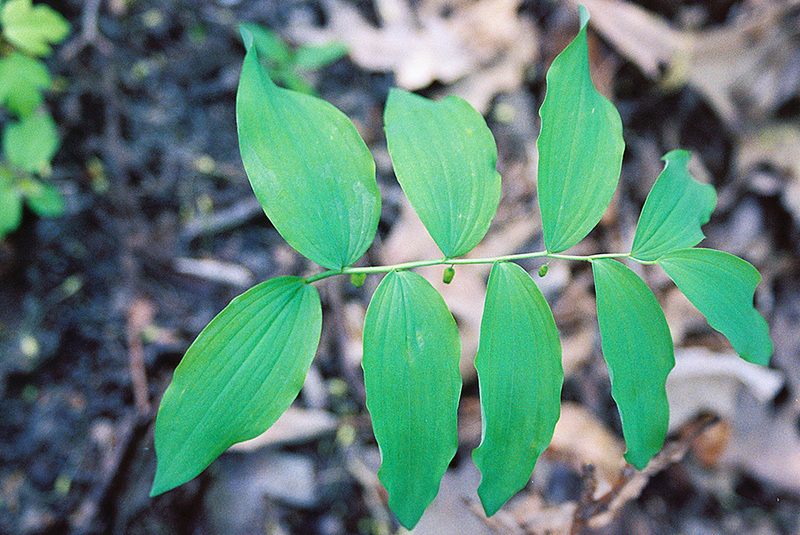 Hairy Solomon’s seal (Polygonatum pubescens) is a shorter plant, reaching no more than 36″ at maturity. The leaves are on short stalks and have minute hairs growing along the veins on the underside of the leaves and on the edges of the leaves. These hairs can be very hard to see. They have 3 to 9 parallel veins. Large-flowered bellwort (Uvularia grandifloria) is a much shorter plant, reaching no more than 20″ at maturity. 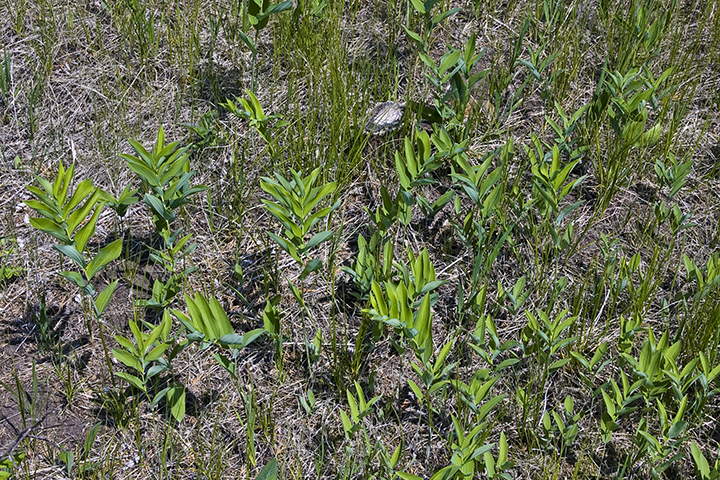 The leaves are perfoliate and have 3 to 5 prominent veins. The flowers are bell-shaped, 1″ to 2″ long, and bright yellow. The fruit is a 3-celled, greenish to yellowish-brown capsule. Rose twisted-stalk (Streptopus lanceolatus var. longipes) is a shorter plant, reaching no more than 36″ at maturity. The stems are hairy, branching, and jointed at the leaf axils giving them a zigzag appearance. The leaves do not clasp the stem. The flowers are dark rose-purple to pink and bell-shaped. The petal-like tepals are not united at the base and turn backward at the tip. They hang singly on stems up to 2″ long that are twisted or have an abrupt bend in the middle. The fruit is bright red. 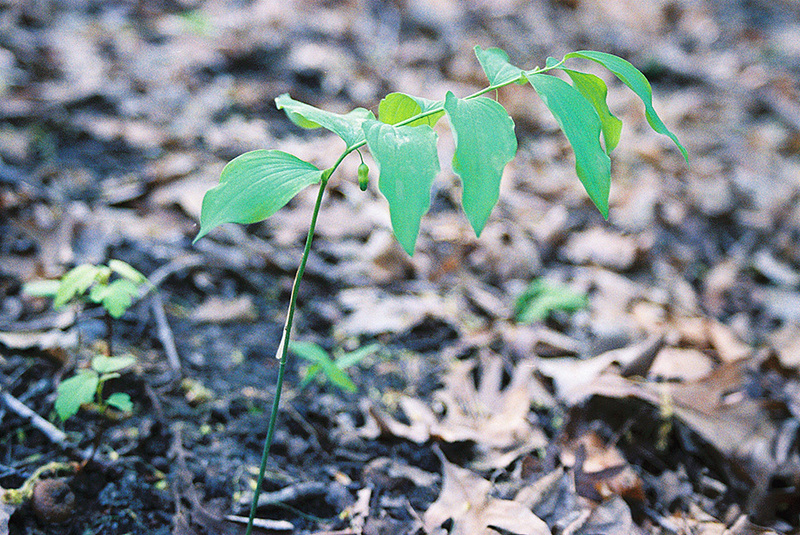 Starry false Solomon’s seal (Maianthemum stellatum) is a much shorter plant, reaching no more than 24″ at maturity. The stem is more erect, reclining only slightly. 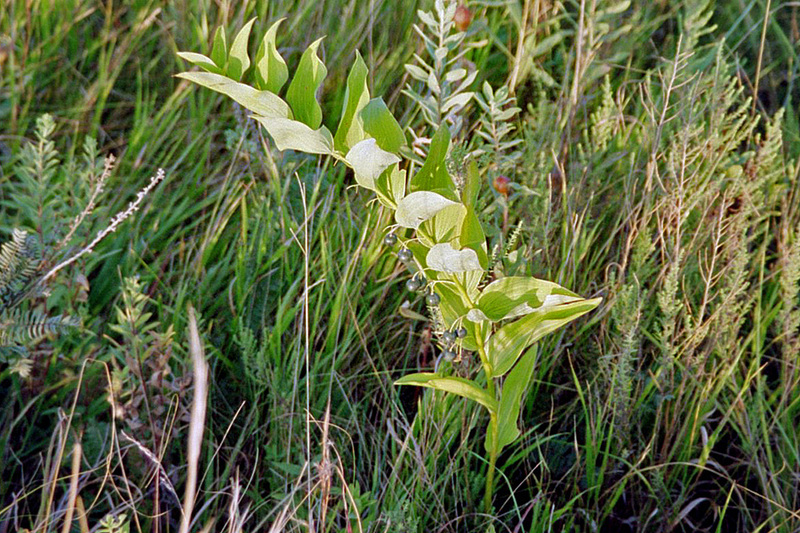 The leaves are lily-like, narrow, and lance-shaped. The upper leaves are usually stiff and erect or spreading. The inflorescence is spike-like, with white star-shaped flowers in an unbranched cluster at the end of the stem. The fruits are yellowish-green when young with 3 to 6 red to purple stripes, and dark blue to reddish black when mature. 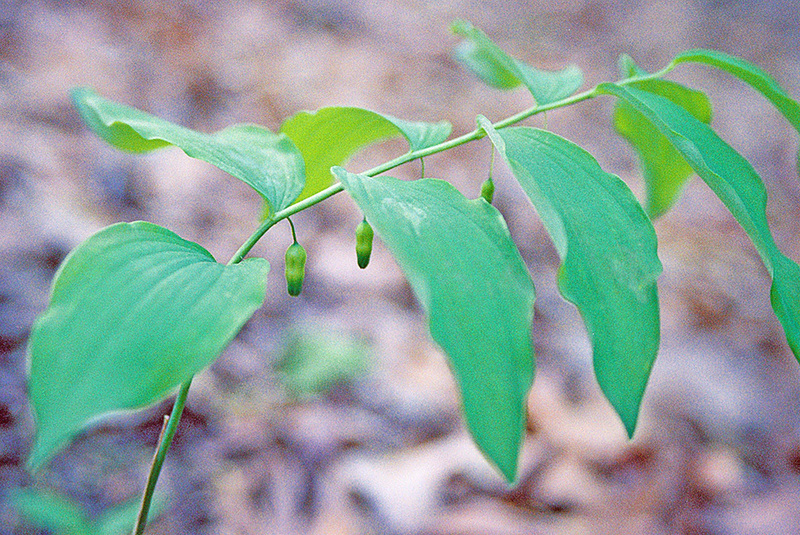 Dan Jaffe continues his series of native plant videos with Polygonatum biflorum, common name: King Solomon's-seal. Le Sceau de Salomon verticillé du printemps à l'automne. Salomon's seal from spring to fall. Polygonatum biflorum de la primavera hasta el otoño. A compilation of bumblebees as they visit Smooth Solomon's Seal at Wildflower Farm. They use buzz pollination to shake out pollen from the deep flower tubes.